Just a little bit of progress! * photos to come once I figure out the visual editor stuff and make it work again. established new pink eye potato bed – C9 using Poly carpet underlay from the second floor (we found a sewing machine bobbin in one roll identifying the source) and horse manure bagged by the Connect students as a fund raiser. So a Poly Potato Patch. planted broadbeans in C5 in back half. Planted Up to Date potatos in O1/O2/O3 under the fruit trees in the orchard in wire circles. They should be relatively protected from frost there for an early crop. Started the 'under the clothesline' redevelopment. 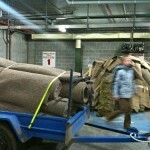 Gathered two huge trailer loads of hessian carpet underlay from work on Thursday night. Hooray for scavenging. Although it did rather look like we were rolling bodies wrapped in blankets down the back nature strip in the dark. No-one called the police though. Moved C8 (previous strawberry bed) slightly uphill and re-edged. This now fits better in the space between the chook shed and nashi pear tree. Strawberries from there were removed and most are still awaiting re-planting. With this cool weather I'm hoping they'll cheerfully sit jumbled in on top of each other in the large tubs until next weekend. I trimmed and potted up about 50 already. Once they've settled we'll plant out into the front garden. Established blueberry patch where old chook shed and grapevine were. Moved 3 Blueberries from C8, planted out 2 from pots loitering near the deck, and 3 new ones. Top 5 are Brigitta, 2 are Blue Rose and 1 Blue Crop. Tucked in along the edge, some oregano and a chamomile. All berries got tree guards to save them from frost. It would appear that blueberries curl up their toes at being in the main frost pathway of our garden. I'd rather not count up how many we've killed. Let's just focus on the better location shall we? Planted from top to bottom Peach – Redhaven, Nectarine – Fantasia, Peach – Elberta, on side of driveway. Planted Apricots 2 Moorpark and 1 Tilton (furthest from gate) over the back fence. Planted out about 20 strawberries in the front garden in gaps. I think it was this weekend I tucked about four more brassica seedlings into C6 and C0. We lost a few plants to aphid overload and their apparent hatred of mushroom compost. These were some of the 'random red brassicas' I got as a freebie in early autumn and had potted on in the greenhouse to fill gaps. 4 jars meat balls in tomato – a number#20 jar holds enough meatballs for the three of us, just needs more tomato and other veg to turn it into a meal. One of the interesting things about reading a lot of foodie/preservation blogs from the northern hemisphere is being out-of-step with their seasons. Many bloggers seem to be excited by rhubarb at the moment, and there has been an explosion of recipes as it is one of the first fruit to emerge at the start of spring. 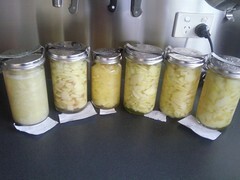 Well, mine was growing all spring, summer and autumn, and this morning I finished what was probably my second batch of rhubarb cooking in 12 months. It doesn’t really go dormant in my garden. The original plants, (thanks for the correction Dad!) came from Marie who worked in the same building as Dad and had this variety in her family for generations.I think the story goes, came from Marion’s mother, Marion lived next door to my parents for a while. It is a lovely thick stemmed red-just-tinged-with-green rhubarb. Because it just sits there, quietly growing and not demanding attention I rarely pick it. The chickens dose themselves on the leaves from time to time (self-medicating for worms perhaps?). Recently I picked a batch to aid pruning access to the apricot tree growing above it. There must be a good six to eight corms there now, from an original two. I suppose I should mulch it or sprinkle some compost on it to provide encouragement. Last night I made Pink Jam – Strawberry and Rhubarb combined with a touch of lemon. But it didn’t set. 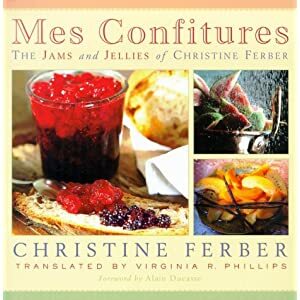 I think I am being impatient with my jam making, and many North American recipes use less sugar than a 1:1 ratio, but ensure a good gel with added pectin. This morning, I emptied the jars into a saucepan, added another 1.5 cups of water and a packet of jamsetta, boiled briefly and rebottled. Within an hour it was a firm set which I do prefer. 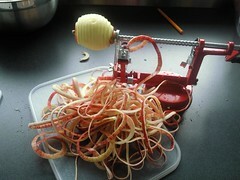 The taste is nice – neither rhubarb nor strawberry dominate, the flavour is very PINK! 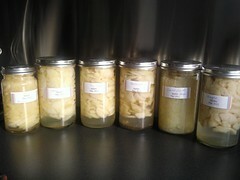 I think I need to stock up on Jamsetta or consider making a batch of pectin stock from green apples before the apple season is out. Saute until transluscent 1 finely chopped onion in a slurp of Penna Valley Olive Oil. Add 600 grams Diced Wallaby from Bruny Island Game Meats (in the second half of this article) and sizzle till starting to brown. Add in 4 chopped carrots, 2 sticks celery chopped fine, the remains of a preserved jar of crushed tomatoes, the dregs of a jar of home made salsa. 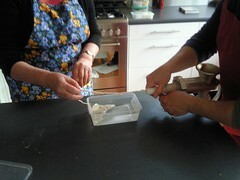 Stir over a high heat until well combined. 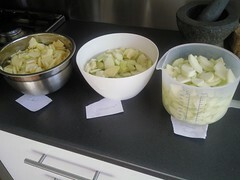 Congratulate yourself on emptying two jars from the fridge. Yes the jars have been breeding in there I am sure of it. Sprinkle in some dried rosemary and also about two tablespoons of a spice rub based on spanish paprika and pepper. Toss in about 1 1/2 cups of cooked black beans that were loitering in the fridge. 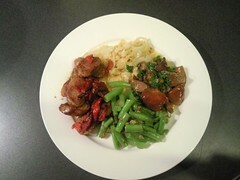 Say a thank you to Jamie Oliver’s 30 Minute Meals for introducing you to black beans. Stir it all around and put on a lid. Turn to low heat to simmer. Drink half your glass of wine. Add 2 cups shredded cabbage. Stir. Replace lid. Drink the remainder of your wine. Serve 3 large bowls and enjoy. 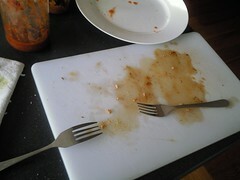 Realise as you are all finishing your bowls someone should have taken a picture. NB: Any ingredient can be substituted. 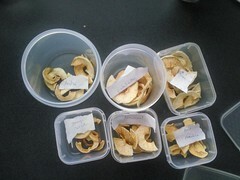 Quantities are based on what you find you have. Otherwise it would not be a mid-week recipe. Except maybe the onion. Most of our dinner recipes start with an onion. 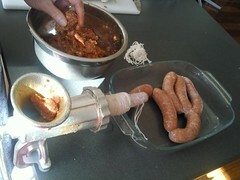 What to do with a side of pork? First freak out at how large a leg is. Then get out the knives and the salt and the recipe books. 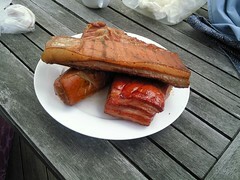 This week we have made 4 types of bacon, 2 types of ham. 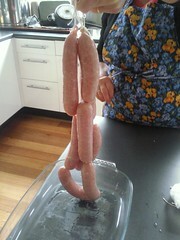 And made our first ever sausages. 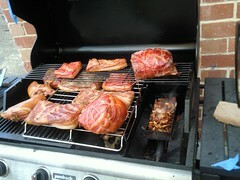 I think we may have enough bacon now. At least for a week or two. 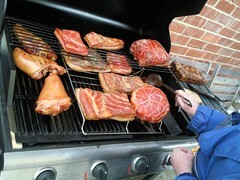 And a wee bit of ham on the side. And a couple of pots of pea & ham soup in the pipeline. 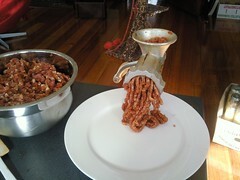 And some smoked chorizo for flavourbursts. Assorted To-Be-Smoked bits L-R Back Row: Thyme Bacon, Maple Bacon, Leg Ham, Hock. 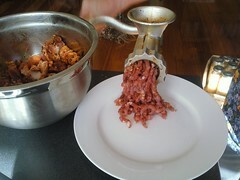 Hiding: Brined bacon (2 small squares) Middle: Fennel/Caraway Bacon, Mum's Herb Bacon, Shoulder Ham. 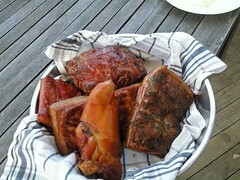 Front Row: Hock, Mum's Gammon, Mum's Dry cure Bacon, Hock. 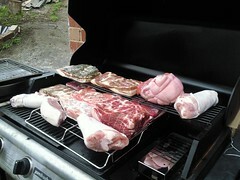 Fully loaded smoking set up 5 sorts of bacon, plain brined hocks, gammon, leg and shoulder ham, chorizo went on later. Adding more Chips We rotated the meats around the bbq to make sure heat was more evenly distributed. 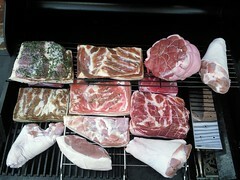 Finished Smoking #2 Clockwise from top: Shoulder ham, Thyme Bacon, Hock, Maple Bacon (under), Brined Bacon. 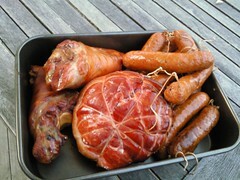 Finished Smoking #3 Two hocks, chorizo sausages, leg ham.